After frost, what’s this winter looking like? On Monday morning, many Connecticut woke up to the first frost of the season. The last time temperatures were this cold was six months ago. 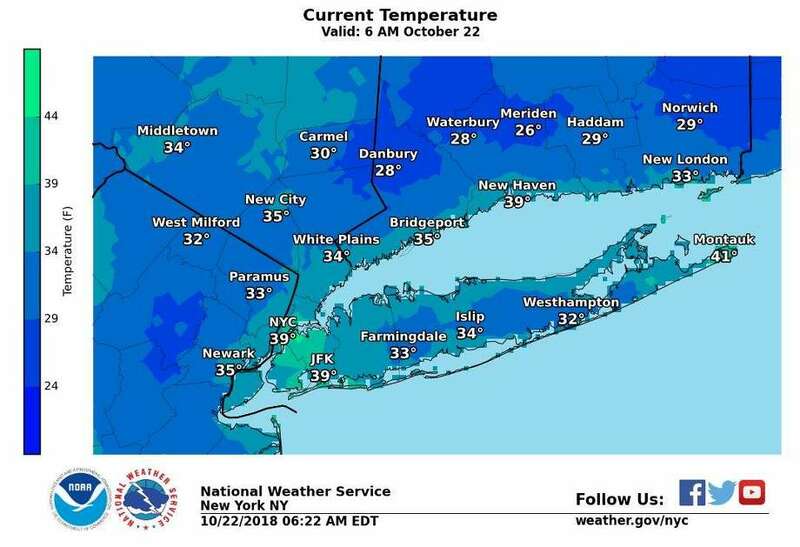 Oxford had a low of 26 degrees; Danbury, 28 degrees; Bridgeport and White Plains airport, near Greenwich, 34; and New Haven, 38. While those readings did not break any cold temperature records, it reminded people that winter-like weather is just a few weeks away. What kind of winter will be have? A mild winter could be in store for much of the United States this winter according to NOAA’s Climate Prediction Center. In the U.S. Winter Outlook for December through February, above-average temperatures are most likely. No area of the U.S. is expected to have below-normal temperatures. Southwest Connecticut has an up to 40 percent chance of above-normal temperaures. The rest of Connecticut, New England and northeast New York State have a 50 percent chance. It says there is an “equal chance” for above normal, or below normal preciptation for the Northeast. NOAA does off offer a forecast as to how much snow could fall. The winter of 2017-18 was a season of extremes for Connecticut. It saw above average snowfall, record cold temperatures and periods of rain and fog. The 36.9 inches of snow at Sikorsky Memorial Airport in Stratford was 14.4 inches above average. With nearly two weeks of below freezing temperatures in the single numbers, Long Island Sound harbors froze and there were ice jams on the Housatonic and Connecticut Rivers. Temperatures were near 80 degrees on Feb. 21, It was the warmest February day ever. March brought three nor’easters that dropped rain and heavy, wet snow. The nor’easters also packed near hurricane-force winds that toppled trees causing up to 168,000 people to lose power across the state. Many southwestern Connecticut residents were without power for days. After early Monday’s mornings chill down, temperatureswill be on the rebound Monday with more of a southwest flow developing. Highs Monday will be more in the lower 50s with some mid 50s for parts of Long Island and throughout New York City. Tonight, with the southwest flow continuing and clouds increasing, lows will not be as cold, within the 40s for most of the region. Temperatures are still forecast to be quite mild Tuesday after awarm frontal passage early with a cold front moving through latein the day. There could be a few rain showers for the region withthe frontal passages.Drier weather settles in for Tuesday night and Wednesday witha cooling trend to temperatures Wednesday, returning to mostly lower 50s. Canadian high pressure during this time will move into the Great Lakes.